SUMO is 14 m long or 14.6 overall. She's surveyed for 23 Passengers Max to the Hen & Chicks (Day Fishing Trips) Groups of 6 - 14 is ideal or 23 Passengers Max in harbour (Christmas party / BBQs). Where is SUMO & Where does she operate to? 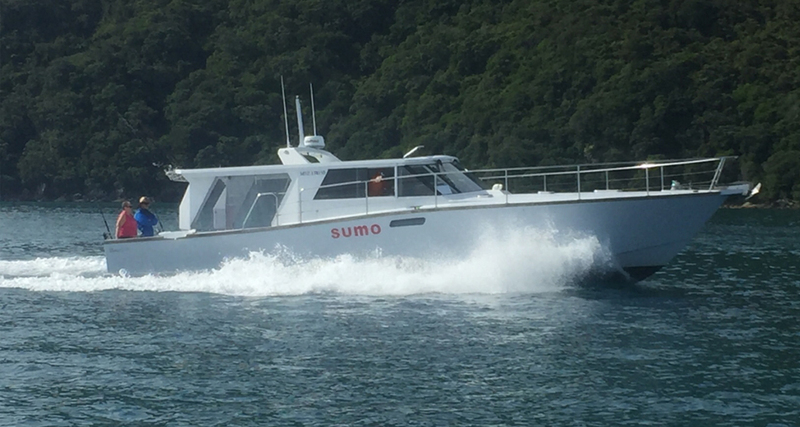 SUMO is based at the new Marsden Cove Marina, berth C9, just inside the entrance to the Whangarei Harbour. She does short trips to Bream Head, but mostly Day and Evening trips out to the Hen & Chicks Isles and also day trips to the Moko Hinau Islands. Also overnight trips to the Moko Hinau Islands. SUMO enters a lot of the Big Game tournaments up and down the East Coast. If there's only 1 or 2 of us do you take individuals and make up a group? Individuals/casuals can join up with others to make up a group. It's $120 each /Eve or $150.00 each / Day for individuals. If you have a small group i.e. 2-5 people, the choice is yours to join others or to exclusive charter of SUMO. min rates are : $700.00 for evenings or half days or $1300.00 for a day trip. What other trips are available & can we mix 2 or 3 types of trips together? Yes I do a full range of trips; Fishing, Diving, Big Game, Overnight, BBQ trips. And YES you are welcome to do a mix of options i.e. 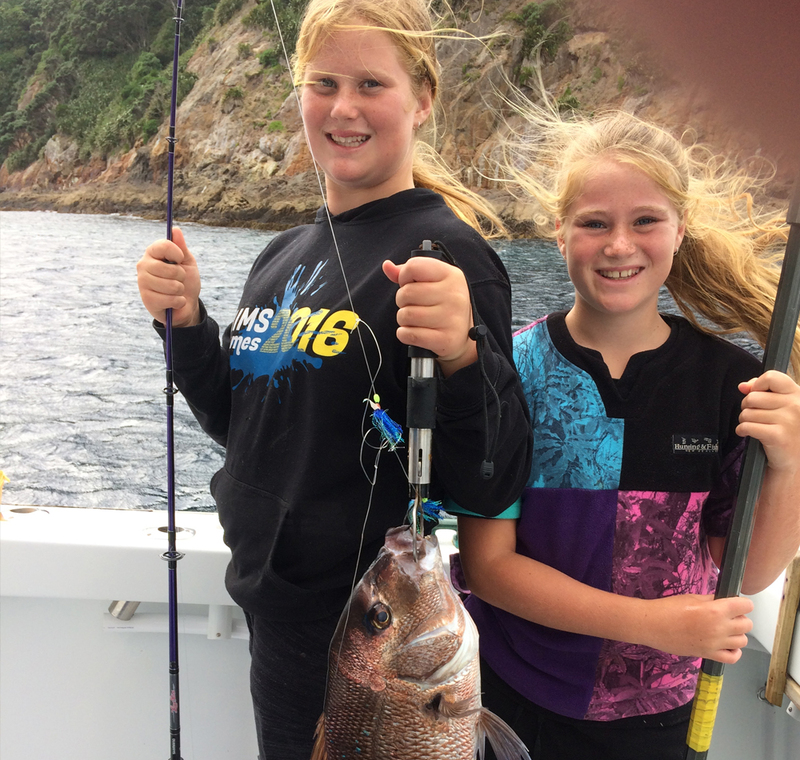 an Overnight 2 day Trip including Fishing, Diving, Big Game & Have a BBQ for meals. Where, When do they start & how long do the trips go until? Evening trips start 5.00 pm - till dark [9.30-10.30 pm daylight saving time only] Hen & Chicks Isles Day trips start 7.30 Am -Till 4.00 Pm. Sometimes shorter or longer depending on how successful we've been. If the fishing's been slow I can often but not always stay out longer than the 8.5 hours. Moko Hinau Islands Day trips start 6.30 Am -Till 5.30 Pm. We always depart from Marsden Cove Marina Berth C9 or alternately McLeod’s Bay Wharf in Whangarei Harbour. Yes. Gift vouchers are available at $150.00 each person for a day trip. What is the cost for a trip on SUMO? Min exclusive charter rate is $1,000.00 /Eve to the Chicks Isles. Min exclusive charter rate is $1,300.00 / day to the Hen & Chicks Isles. Day Fishing - 11 hour day trip to the Moko Hinau Islands. Min exclusive charter rate is $1,720.00 / day to the Moko Hinau Islands. Moks Overnight Multi Day Trip Departs 7.30 AM $1720 per day. Min 2 days I.E. $3,440.00 for a Mokes 2 Day weekend. Hire rods are available at $15.00 or $25 each. Do we bring our own Rods, Bait & lunch? Can we Hire rods & do we need to give a deposit? It's BYO Bait, Burley, Rods, tackle & Lunch. I have hire rods available at $ 15.00 or $25 each. I can supply bait but with a $25 surcharge attached. I suggest getting your own on the way as this is the best & cheapest option & adds to the day's experience. Yes I ask for a $500.00 deposit to secure the booking. How many people can we take or what is a comfortable number? 6-14 Fishermen for a day or evening trip to the Hen & Chicks is a good comfortable group. 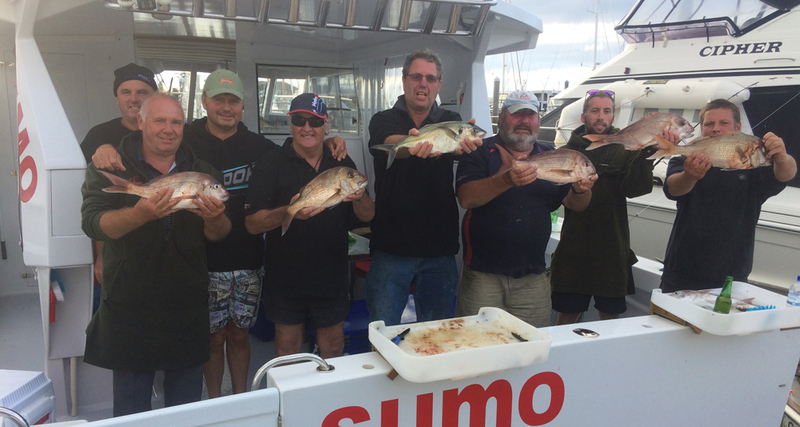 6-14 Fishermen for a day trip to the Moko Hinau Islands is a good comfortable group. School groups of 12 Kids + 2 or 3 adults is common. 4 - 8 max for an overnight trip to the Moks or Chicks.